In 1877, a Mr John H Neale, superintendent of the Montezuma Tunnel Company, was engaged in building a tunnel through Table Mountain, Tuolumne County (California, USA). The tunnel was running through gravel, sealed by lava. Between about 425 and 457 m (1400-1500 feet) from the mouth of the tunnel and between 61 and 91 m (200-300 feet) from the edge of the solid lava, a number of dark stone objects about 300 mm (one foot) long were reported to Mr Neale. 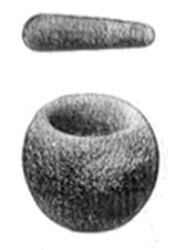 Close by, he found a small bowl-like object between 75 and 101 mm (3-4 inches) in diameter; further exploration revealed a larger bowl-like object and a pestle-like object. They were all found in the gravel within 300 mm of the underlying solid bedrock. The gravels through which the tunnel was dug were estimated as being between 33 and 55 million years old, so objects found in situ within them ought to have been contemporaneous. Some years earlier, in 1857, a fragment of human skull was found close to mastodon remains, while a complete human skeleton discovered even earlier had been associated with similar material; they were thought to be evidence for Miocene humans. In 1877 Mr. J. H. Neale was superintendent of the Montezuma Tunnel Company, and ran the Montezuma tunnel into the gravel underlying the lava of Table Mountain, Tuolumne County. The mouth of the tunnel is near the road which leads in a southerly direction from the Rawhide Camp, and about three miles from that place. The mouth is approximately 1,200 feet from the present edge of the solid lava cap of the mountain. The course of the tunnel is a little north of east. At a distance of between 1400 and 1500 feet from the mouth of the tunnel, or of between 200 and 300 feet beyond the edge of the solid lava, Mr. Neale saw several spear-heads, of some dark rock and nearly one foot in length. On exploring further, he himself found a small mortar three or four inches in diameter and of irregular shape. This was discovered within a foot or two of the spear-heads. He then found a large well-formed pestle, now the property of Dr. R. I. Bromley, and near by a large and very regular mortar, also at present the property of Dr. Bromley. All of these relics were found the same afternoon, and were within a few feet of one another and close to the bed-rock, perhaps within a foot of it. Mr. Neale declares it utterly impossible that these relics can have reached the position in which they were found excepting at the time the gravel was deposited, and before the lava cap formed. There was not the slightest trace of any disturbance of the mass or of any natural fissure into it by which access could have been obtained either there or in the neighborhood. And Mr. J. H. Neale declares upon his oath that the foregoing statement is in every respect true. One of the miners coming out to lunch at noon brought with him to the superintendent’s office a stone mortar and a broken pestle which he said had been dug up in the deepest part of the tunnel, some 1500 feet from the mouth of the mine. Mr. Neale advised him on returning to work to look out for other utensils in the same place, and agreeable to his expectations two others were secured, a small ovoid mortar, 5 or 6 inches in diameter, and a flattish mortar or dish, 7 or 8 inches in diameter. These have since been lost to sight. On another occasion a lot of obsidian blades, or spear-heads, eleven in number and averaging 10 inches in length, were brought to him by workmen from the mine. They had been found in what Mr. Neale called a ‘side channel,’ that is, the bed of a branch of the main Tertiary stream about a thousand feet in from the mouth of the tunnel, and 200 or 300 feet vertically from the surface of the mountain slope. These measurements were given as estimates only, but at the same time they were, he felt sure, not far wrong. Four or five of the specimens he gave to Mr. C. D. Voy, the collector. The others also had been given away but all trace of them had been lost. Mr. Neale spoke enthusiastically of the size and perfection of these implements, and as he spoke drew outlines of long notched blades in the dust at our feet. Some had one notch, some had two notches, and others were plain leaf-shaped blades. Desiring to find out more concerning these objects, he went on to say, he showed them to the Indians who chanced to be present, but, strangely enough, they expressed great fear of them, refusing to touch them or even speak about them; but finally, when asked whether they had any idea whence they came, said they had seen such implements far away in the mountains, but declined to speak of the place further or to undertake to procure others. These accounts are quoted in a paper by William J Sinclair, “Recent investigations bearing on the question of the occurrence of Neocene man in the auriferous gravels of the Sierra Nevada”, published in University of California Publications in American Archaeology and Ethnology, volume 7 number 2 (1908), pages 108-131. After a careful review of the evidence to date, Professor Sinclair concludes that a “review of the evidence favoring the presence of the remains of man in the auriferous gravels, compels one to regard it as insufficient to establish the fact. On the preceding pages, it has been shown either that there have been abundant opportunities for the relies in question to be mixed with the gravels accidentally, or that the geological conditions at the localities are such as to render it improbable that the implements and bones have been associated in the gravels to the extent supposed”. There is really little to add to Professor Sinclair’s conclusions. The objects – if genuinely found inside the mine – were identical to those of recent date found outside it; this argues strongly in favour of their recent manufacture (‘recent’ in this context meaning in the past ten thousand years or so!). The use of a rock found higher up the mountain to maufacture these objects shows that it must have existed before the artefacts; if they were really buried beneath it, they must have been introduced by some means, such as tunnelling. The story of the discovery is by no means as robust as its supporters would wish. Mr Neale’s memory of events thirteen years previously may have been flawed; he may have been the victim of a hoax; he may have been the hoaxer (although this seems unlikely). All in all, this is not good evidence for the antiquity of humans in North America. it’s all a simulacrum! or a fake! or it’s the antikythera mechanism, which you don’t know much about, except to say “well, calling it a computer just makes it sound mysterious.” It is a computer, and it is mysterious. Too much bias in your writing here. Well, unfortunately that’s what most of these so-called “out-of-place artefacts” are. They are largely misidentifications by people who wouldn’t know a human product from bovine excrement. The Antikythera mechanism is not a computer: it’s a geared mechanism of a type we already knew to have existed (similar machines are mentioned by Classical authors). The only bias in my writing is to show up stupidity and willful misrepresentation for what it is. Deal with it. Many of these finds were uncovered during deep earth mining projects. This is well-documented. So what are you suggesting, that a miner or miners, quickly carved out some of the pieces and then claimed they were discovered during their digging? That is immensely absurd. The fact is, there is an orthodox and established history that we’ve all been taught but more and more discoveries are challenging and laying waste to these age old historical conclusions that are in dire need of re-evaluation. Scholars DID make a mistake on the Antikythera mechanism. Although written references and descriptions of similar devices where indeed known, it was assumed that they shouldn’t be taken literal. And then one of those devices turned up. I’ve updated the page, as subsequent research has convinced me that the artefacts were genuine, so thank you for ridiculing my original suggestion that they were simulacra. Nevertheless, your contention that they were from “an environment sealed for 30 plus million years” looks even less likely after reading that (1908) paper to which I refer. They were never good evidence. Please, if you’re going to criticise, at least get your facts straight. Lucy’s remains were all found at the same site. It’s funny how creationists only ever quote the arguments of creationists, isn’t it? And it’s also funny how creationists are keen to quote the original reports but never their refutations. And funnier still that they will never admit their mistakes when they are pointed out. Science is willing to admit its errors and move on; dogma is incapable of doing so and it’s ironic that it’s those most bound by dogma who project inflexibility on to science! I’m not a creationist at all…..; In fact i detest relgious ideology as it has existed throughout the millenia. i’m glad to see you’ve dropped the ridiculous idea of simulcra. I suggest you look a bit deeper into the lucy story, and you have to look deep as the flag waving lucy faithful don’t like discussing the actual location facts on this find. Many scientists ( of the unbible thumping genre) btw are convinced that lucy is simply another ape, whose juvenile state makes it appear more human than it is, (see juvenile ape skeletal morphology); but such is the zeal and frustration of the missing link seekers, that this thin, woefully crappy piece of evidence is venerated to the extent that it is no longer even wise in terms of ones career, to point out how pathetically weak the missing link lucy case is. Interesting that the other artifacts, as well as the mortar and pestle have gone missing from the table mountain site;, interesting also that the calveras skull from the same site, has been explained away as a hoax, because a different skull had been placed in the dig as a practical joke at around the same time. The practical joker btw is known and is on record stating that the caleveras skull is not the one he planted. Your own confirmation bias is so apparent here, that really you would be better off prefacing this site with a disclaimer which honestly expressed your own assumptions, beliefs and fixed ideas…….something like this perhaps…….. The disclaimer you would like to see me put on the site is clearly creationist: no-one but a creationist uses the term “evidences”. It’s a word that exposes exactly where you’re coming from. I wholely agree with Keith Meterink here.Upon finding this well organised site, while looking into the discovery of this mortar and pestle, in 20 million year old rock, seeing immediatly that its named BAD Archeology, I knew it’d be a bedunking site, but had to read on to see what the programmed gatekeepers used to rubbish real science. /information/beleif/ideas, (pick your word- don’t get hung up on symantics ) . Whereas these debunking sites, can only feebly try to pick holes in the multitude of evidences…. (oh no I said it… must beleive the earth is 8 thousand years old). Why don’t you, Mr. Fitzpatrick, present evidence, or information, or what ever you wan’t to call it, for your particular theorey. And with this accusation of creationist on this tread I’d like to make you aware of how foolish you should sound, the implication is that of literal bible believing christian perspective, whereas this artifact puts pay to that idea, showing intelligent life here many millions of years ago. Do you assume Keith Meterink thinks god placed it in that rock at 8 thousand years ago to test our faith in his exact word as transcribed in the bible? And of course this is only one artifact found that blows huge holes in the orthodox evolutionary timeline, the age of the sphinx, homo sapien footprints millions of years old, the Klerksdrop speres 2.8 BILLION years old. Hipocracy is the greatest luxury they say, but I don’t know how comfortable you should feel, banding around insults of dogmatism, doggedly defending your crumbling theorey of uniformatarianism, when people of an inquisative sceintific nature wan’t to have a look at all evidences with an open and rational approach to any information. Not just immediatly deeming an artifact as obviosly false, cos it doesn’t tally with you entrenched dogma. Evolutionism as it stands now is just as repressive a religion as those preceding it. When somebody like Keith Meterink comes out with a statement like “Many scientists ( of the unbible thumping genre) btw are convinced that lucy is simply another ape”, I see only creationist propaganda. Any scientist who thinks that Lucy is “simply another ape” is either using the term ape in its broad sense that all humans, including human ancestors, are all apes, or is guilty of deliberate misrepresentation. If Mr Meterink knows of many scientists of this opinion, perhaps he could let us know who these eminent biologists are. I fail to see how the age of the Sphinx of Giza has any bearing on “the orthodox evolutionary timeline”: it has nothing to do with the evolution of our species. If it is older than conventional egyptology believes (and remember that Robert Schoch’s guesstimate was 6000-7000 BCE, not the impossible 10,500 BCE of Graham Hancock and his acolytes), that would be very interesting indeed; the problem is that, if it really is that old, it sits in glorious isolation, with only scattered Neolithic farming communities to build it, rather than a Copper Age state system that was able to gather corvée labour. It would be a puzzle, but it certainly wouldn’t “blow huge holes in the orthodox evolutionary timeline”! You seem to have fallen prey to various claims for fossilised human footprints, none of which has ever survived the slightest critical scrutiny. As for the Klerksdorp Spheres (otherwise known as the Wonderstone spheres), I’ve dealt with them on this site and, once again, they have no bearing whatsoever on “the orthodox evolutionary timeline”. I really don’t understand why you have to rail against ‘evolutionism’ so much. I am not a biologist but an archaeologist; this site deals with archaeology, not biology. You are hardly doing your case any good by constantly conflating claims of ancient artefacts with attacks on evolutionary science, on which they have no bearing at all. Hey, who doesn’t love a good bedunking? read your piece on the Klerksdorp speres, would hardly say that you’ve dealt with them, as strong as your argument gets is that the national enquirer reported on them, so it must be rubbish. And your logic on the grooves follows the same dogmatic line as you use with the sphinx, ie its impossible to have been carved that long ago because……..? Oh yea your religion dictates it. Robert Shloch I beleive adjusted his ‘guestimate” when pressure was brought to bear by the uniformalist clergy, whereas his initial statment was that the shinx was atleast 10 thousand years old, that being the last time significant constant rain would have affected Egypt. I rail against evolutionism, as you rail against creationism, because I see it has become an unscientific religion all of its own, with a perspective and timeline dogma that must be defended against any information to the contrary. (The same way 8000 yr literal bible believers will deny evidence to the contrary). But really it is uniformatairianism that is my target, of which evoultionism is a part, and your tired dogmatic archeology bows too, because you’ve decided that anything more ancheint and wonderious is IMPOSSIBLE. You do know how metamorphic rocks form, don’t you? That means that the Klerksdorp spheres formed in a rock at high temperatures: had they existed befre the rock, they would have been melted during its formation. It doesn’t matter that the source is unreliable: anybody who knows even the most basic facts about metamorphic rocks will know that the spheres must have formed inside it, as it cooled. There is no alternative explanation. I don’t have a religion, so don’t criticise me for it. I follow where evidence leads me. I can form my own opinions. Robert Schoch never put the Great Sphinx at 10,000 BC: the oldest he would allow it to be is 7000 BC. He may actually have revised it to be older, following Hancock; he certainly hasn’t been pressurised “by the uniformalist clergy”, whoever they may be. My opinions will never morph into faith because I have a low opinion of faith: faith is believing something despite evidence to the contrary. It’s really quite laughable that you talk about “tired dogmatic archeology” when the way to make a name in archaeology is to overturn the theories and hypotheses of the older generation. You clearly have no knowledge of how academia works. By the way, science never ’proves’ anything and never will. Proof is a mathematical concept. Science deals in theories and hypotheses that best explain the available data. When new data comes along that doesn’t fit, it’s science that changes, the very opposite of how faith works. he uses “may” to describe his conjucture, words of a scientist with a theorey, you use the terms “certainly” and “impossible” which are those used by folks defending a dogma. Your whole site here is dedicated to rubbishing any discoveries that threaten the orthodox uniformatarian timeline, and your style is to snigger at those who would open their minds to other possibilities, branding us creationists and wingnuts. So who’s behaving like a religious zealot? Incidentally, if we begin on the topic of Egypt and its monuments, would you be one of those defending the orthodoxy of primitive peoples carving with copper chissels, and rolling 700 tonne blocks on palm trunks to create these great structures? The real problem with back-dating the Great Sphinx to Schoch’s preferred date is the failure to explore the consequences of such a date. If the Sphinx were that old – and I can honestly say that when I first heard about Schoch’s hypothesis, I was excited by the possibilities and convinced by his geological expertise – then there must be other evidence from that time. A society capable of building a monument of this type cannot have disappeared without trace, as human beings are notoriously messy creatures that produce a great deal of rubbish. Consider this: the Great Sphinx is in an abandoned quarry, which was abandoned when several fissures in the limestone, visible in the Sphinx’s rump, were discovered as the stone would have been unusuable. Why were they quarrying the stone? Presumably to make a masonry structure somewhere. This means that we ought to be looking for a structure composed of limestone blocks that is contemporary with the Sphinx. The problem is that no masonry structures have been found in Egypt that date from the period 7000-5000 BC. This isn’t to say that some won’t be discovered one day, although it is surprising, given the intensity of archaeological investigations in Egypt over the past two centuries, that none has been discovered. Hancock has tried to make the Valley Temple of Kha‘re’s pyramid and the Osireion at Abydos of this sort of age, but the artefacts associated with their construction (the beautiful diorite statue of Kha‘efre in the case of the Valley Temple – it has his name on it, so it’s not a matter of mistaken identity) confirm the conventional chronology. We need some other structure to explain what a quarry of 7000-5000 BC was dug for. That’s not the only problem, though. The workforce necessary to quarry limestone blocks has to come from somewhere, which implies three things: a population large enough to spare some of its fittest members to work in the quarry, an agricultural regime the produced a surplus sufficient to keep these quarrymen alive and a political organisation capable of conivincing people that such work was a good thing (or else coercing them into it). However, the earliest evidence we have from Egypt for Neolithic settlements (in other words, farming) belongs to the Badarian culture, from about 5500 BC (ignore the Wikipedia entry, which uses a book of 1928 to date the Badarian to after 4400 BC!). Badarian Egypt consisted of small villages practising subsistence agriculture, with structures consisting of skin tents. They had trading contacts to the east, in the Arabian Peninsula, Sinai and Palestine; their crops and livestock came from these areas rather than the wild resources of the Nile Valley. Their ceramics were of high quality and the origins of Egyptian art can be seen at this time, even if its products were highly tentative. In other words, there is little room here for a society that needed to quarry limestone blocks or to create a monument whose iconography is more at home in dynastic Egypt. Go farther back in time, to the hunter-gatherer society that existed before 5500 BC, and there is even less reason to suspect a society that was interested in quarrying. True, at Göbekli Tepe, some 1100 km north-north-east of Cairo, there is a masonry structure dating to around 10,000 BC and built by hunter-gatherers, but this is way outside Egypt and has no bearing on the Sphinx quarry as the former is built from small drystone walls with monolithic T-shaped pillars, while the latter was evidently used to extract large cubic blocks, to judge from a few surviving quarry scars. Moreover, the population of Epi-Palaeolithic Egypt appears to have been small and thinly spread. Those are the implications of making the Great Sphinx much earlier than conventional Egyptology will allow. What do the Schochs and Hancocks of this world do? Instead of looking at the well-dated evidence that ought to be contemporary with an earlier Sphinx, they simply conjure up a “lost civilisation” to account for it and completely ignore the evidence that does exist. This is both selective treatment of the data set and deliberately misleading: they pretend to their readers either that there is no evidence (they are of the type who are fond of proclaiming that Egyptian civilisation sprang up fully formed with no trace of prehistoric development, a statement that is, frankly, a lie) or that the evidence is irrelevant (they hint that it is wrongly dated or belongs to a people who were not involved with this otherwise invisible super-civilisation). You ask “would you be one of those defending the orthodoxy of primitive peoples carving with copper chissels, and rolling 700 tonne blocks on palm trunks to create these great structures?”. I take great exception to the idea that the people of Copper Age Egypt were in any sense “primitive”: how dare you insult them in such a way. They were every bit as sophisticated as we are, both intellectually and socially, although they lacked out technology. This does not make them “primitive” and it tells me a lot about your attitudes if you believe them to have been so. And by the way, nobody believes that the Egyptians built pyramids by “rolling 700 tonne blocks on palm trunks”. That’s such a silly assertion that I’m tempted not even to refute it. But I will. The blocks in the Great Pyramid are an average of 2 tonnes a piece; the heaviest blocks are the granite ceiling blocks in the King’s Chamber, estimated to be between 50 and 70 tonnes each. The Egyptians did not use rollers: they used sleds, as shown in depictions of men moving colossal statues. There have been enough experiments showing how these blocks can be quarried and moved using the technology available to fourth dynasty Egyptians that to make claims they cannot is to remain wilfully ignorant or deceptive. Which are you being? You also say that the “whole site here is dedicated to rubbishing any discoveries that threaten the orthodox uniformatarian timeline”. Having called you out on the term “evolutionism” you’ve changed tack to attacking uniformitarianism. Did you think I hadn’nt noticed? Just as evolution is a concept from the biological sciences, not archaeology, uniformitarianism is a concept from geology and of very dubious relevance to archaeology. Uniformitarianism does not suggest how an historical chronology of human societies might be constructed, so you’re attacking a straw man. You then go on to criticise my style as one “to snigger at those who would open their minds to other possibilities”. While I admit that I do try to bring a bit of humour to what I write, it is not intended to come across as sniggering or sneering. Point out where I do so and I will quite happily modify it. You also accuse me of “ branding us creationists and wingnuts”; I have accused you of being a creationist, because that is what you appear to be. No-one but a creationist (or someone engaging in apologetics) uses the terms ‘evidences’ or ‘evolutionist’, so if the cap fits, wear it. By the way, I have never used the term ‘wingnut’, which sounds far too American for my tastes. I never use the term “race”, so you’ve just put up a straw man. And you evidence is… what exactly? Gonzalo, I am not “an evolution-obsessed short minded ignorant”. Evolution is a biological concept, not archaeological: I find it provides the best explanation for the biological diversity of our planet, but it has no bearing whatsoever on my understanding of archaeology or alleged “mysteries”. Rather, I suspect that you are the one who is “evolution-obsessed” in that you seem passionately to dislike its implications. You are the one who appears to me to be “short minded” if you can’t see (or are unwilling to see) what the evidence from multiple sources suggests. This is the meaning of the word I use it once on my website. This is in my own careful translation of a text originally written in Swedish. The word used in the Swedish original is the same in singular and plural forms. If I use it incorrectly please correct me! I was already considering revision due to a detail of the text I had not thought of before. As other commenters have suggested, you are dogmatic, (and in my opinion, hidebound) because you will not venture further from the shore than the outstretched hand of the last “scientific” citation will allow you. All great scientists were free thinkers, something you will never be. You are only treading within the halls of an established institution. Your institution, however, is intellectually bankrupt, as its response to legitimate, reasonable questions is merely to ignore them. What is your explanation for global megalithic culture? Why do the indigenous peoples surviving at megalithic sites consistently attribute them to ancient advanced civilizations that preceded them? Why do the maths encoded in megalithic monuments reveal advanced understanding of the dimensions of the solar system, and the phenomena of gravitation and acceleration if they were indeed, as you maintain, the products of cultures that had not even discovered the wheel? Why do megalithic sites align along great circles? 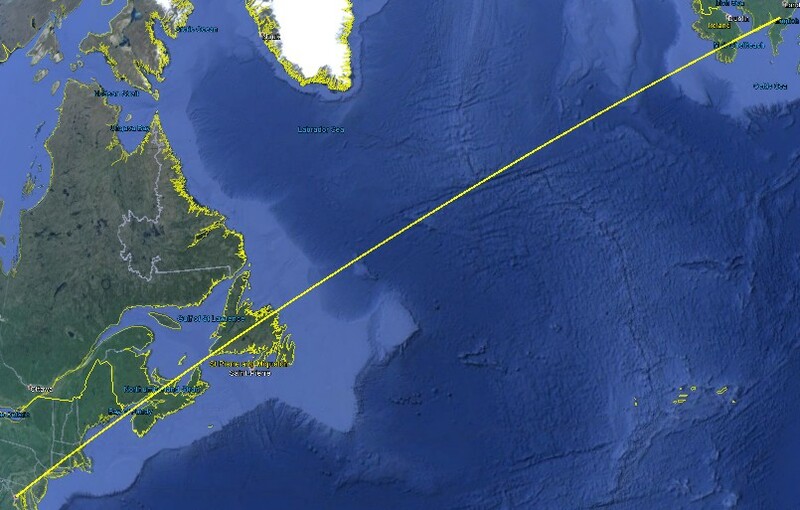 (And why did the founders of the USA see fit to place Washington D.C., Philadelphia, New York, and Boston on a line that when extended northwards transects Stonehenge?) How likely is it that in 7,000 years, all of human civilization is accomplished, when your own establishment’s estimate of our species’ time on this planet is over 28 times as long? What were we doing for the other 193,000 years? Can you fit a statistical model to that trajectory of development? Can you find another natural process that has unfolded in a similar way? I apologize for allowing myself to indulge in personal attacks, but you, sir, should aspire to greater humility and open mindedness. You are obviously intelligent and erudite, but you trust your establishment too blindly, and your antipathy towards religion biases you against valuable historical records. BTW, archaeologists have confirmed, and continue to confirm, many biblical cities and persons previously believed to be mythical. But of course you know that. The usual raft of insults. I’m closed-minded, dogmatic, hidebound. As for the silly argument that “ How likely is it that in 7,000 years, all of human civilization is accomplished, when your own establishment’s estimate of our species’ time on this planet is over 28 times as long? What were we doing for the other 193,000 years? Can you fit a statistical model to that trajectory of development?”, that has been refuted so many times, it’s really easy. To start with, there are pages in the TalkOrigins archive dealing with both “why didn’t agriculture start sooner if humans have been around so long?” and “why is written history so short if humans have been around so long?” questions. As for my “ramblings of Paul” comment, I understand perfectly well whom he was writing for and the context of the irrelevant quote that was directed at me. I have no “antagonism” toward religion. Any antagonism I have is toward ignorance, the wilful distortion of evidence and the use of ancient texts as authoritative when they do not chime with the evidence we have. If you think that “Biblical Archaeology” has achieved what you claim, I suggest you get yourself a copy of Israel Finkelstein and Neil Asher Silberman’s The Bible Unearthed. Then, if you can stomach it, Hector Avalos’s The End of Biblacal Studies. The line on the Google Earth map (which is based on a sphere, not a projection onto a plane surface) is a great circle. The distance calculator doesn’t show that the points you claim to be on the great circle actually are: it just calculates distance. After reading why Douglas Theobald used the word “evidences” I have decided not to use it. The PDF file on my website will be changed as soon as I get time and energy for it. Can you actually read Ancient Greek? If so, I would listen more to you about the content of the New Testament than to someone relying on a 17th century translation. Especially if that person is a Biblical literalist. I studied Greek at school. I’m very rusty indeed, but with a decent dictionary in one hand, I can make a stab at translating it. I have a real problem with people who quote only translations and can’t engage with the original language! My comment about original languages wasn’t a criticism of you: it was intended to be a criticism of people who quote Biblical (and other) texts without understanding that the words they are familiar with may not be accurate. I hope you’re not offended! Don’t worry, I did not take offence. But it was nice of you to clarify. Keith, I have to say, being an agnostic without a “dog in the fight” (yes, I am American), I have to say that you are indeed a bit closed minded to the possibilities that “main stream” science (in all forms) is at times highly speculative (and that is being generous). Take for example your reference to the “hunter gathers” that you mention at Göbekli Tepe. Reading over that page is the epitome of bad science, pure conjecture, and fantasy masquerading as science. Here are a few examples of such unadulterated speculations. “It has been suggested that an elite class of religious leaders supervised the work and later controlled whatever ceremonies took place”. Seriously? It has been suggest (by me) that that is a complete crock without any basis in fact. “As there is little or no evidence of habitation, and the animals pictured are mainly predators, the stones may have been intended to stave off evils through some form of magic representation. ” Seriously? Who in their right might would offer up such speculations? That is just laughable. Perhaps it was a market and that was the earliest form of advertising? Who the heck knows? The truth is NO ONE knows. The entire page speculates how it is just amazing that these “assumed hunter gatherers” could construct this site and that there were signs of “labor divisions”. What kind of cockamamie statement is that? Of course there were divisions of labor as the women were more than likely not hauling these giant blocks from a quarry. Just because there has been no evidence of an agrarian society does not mean that they did not exist, especially considering that only 5% of the site (estimate) has been unearthed. Any logical person that is not accepting the absolutely undeniable speculations just sit back in amazement at the so-called experts that dream up these “facts” without any merit what so ever and you gobble up this information as if it were a religion itself. Only time and perhaps decades of hard work will unravel the mystery of Göbekli Tepe and other sites. It is no wonder to me that you have those of a religious mindset arguing with you about what is known and what is not known because you are really defending a position that is indefensible. In the meantime, I suggest that you open up your eyes a bit and quit calling the kettle black when it comes to ill founded ideas pushed forth to the public which is really more of a disservice and anything. Heath. I think that you are being a little over-critical of the page to which I provided a link. For instance, with regard to the builders having a hunter gatherer economy, there are two principal strands of evidence: firstly, what economic evidence do contemporary sites possess (they all show a hunter gatherer lifestyle) and secondly, what evidence is there for agriculture in contemporary sites (none that has yet been discovered)? It is a simple matter of following the best available evidence. As always, that may well change. With regard to what the external site says, yes I would take issue with a number of the statements. We must assume that there was some sort of willingness to construct the site by a dispersed and largely mobile population: what can have been their motivation? Suggesting that there may have been a class of religious leaders is one possibility and there are good anthropological parallels for it. It is necessary for prehistorians to speculate about the function and meaning of the site, otherwise all we can do is gawp at it in uninformed wonder. If your suggestion of it being a market, then there would be archaeological evidence to back it up in the form of discarded unsaleable items (food that had gone off, broken artefacts and so on: the sorts of things that characterise known markets). I know that your suggestion isn’t meant seriously, so there’s no point in subjecting it to a critique. And you seem to be muddling facts and hypotheses. The facts about Göbekli Tepe are those that relate to its form, its construction and its date. the rest is hypothesis. You are absolutely correct to say that “[o]nly time and perhaps decades of hard work will unravel the mystery of Göbekli Tepe and other sites”: I couldn’t agree more! But in the meantime, archaeologists will have to construct hypotheses that try to explain the site; the testing of these hypotheses is accomplished by posing new research questions and doing further fieldwork and analysis to try to answer those questions. I get thoroughly bored by accusations of being closed-minded. I don’t know how many times I have denied it. But people never listen because they would rather believe the uninformed speculations of people who are prepared to gawp at ancient monuments and artefacts rather than go out and do the hard work (which includes decades of study) that would help them offer hypotheses with half a chance of being accepted. Ok I appologize for being over critical. I just feel that in many areas of science that the professional speculation quickly morphs in to “establish fact” and it seems that we are bombarded with this mentality in our daily lives be it a discussion of Göbekli Tepe or for that matter modern physics and astronomy (dark matter, dark energy, verification of black holes, etc). The list of possibilities is endless but I feel that speculations somewhat dangerous at times unless it is clearly labeled as such. I have seen many things as a casual observer and often find myself in complete disagreement with the “authorities” that often rely on sheer fantasy and few call them out on it (for a variety of reasons). There are a plethora of exmaples of this. Over the past few decades there have been some amazing discoveries that turn conventional thinking on it’s head. Everyone should be open to the idea that what we do know for certain but a fraction of what we do not know. Everyone should always be encouraged to research even what seems implausible. Thank you for your time and hard work on the site. Heath. Please exuse the typos. I will review posts more throughly in the future.